Rainford Tennis Club were celebrating at the 2012 Lancashire Tennis Awards as Conor Porteus was presented with the Young Volunteer of the Year award. Eighteen year old Conor received the award following an online vote at the awards ceremony which took place at the Reebok Stadium in Bolton. The award was won in recognition of all Conor's voluntary work in helping with the running of coaching and competitions both at the Jubilee Recreation Ground and the Spinney Park. Rainford Tennis Club were on the shortlist to win the Club of the Year award whilst our Head Coach, Samuel Jalloh was nominated for the Coach of the Year Award. 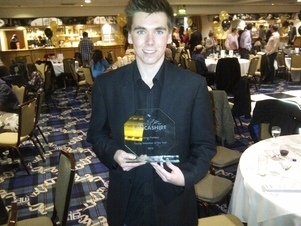 "Everyone at Rainford Tennis Club would like to congratulate Conor on his award" said Club Secretary, John Case. "He has given up so much of his free time to help grow tennis in the village and we are very grateful for his support. We would also like to congratulate Sam on his nomination and thank him for all his hard work over the past twelve months." Rainford youngster Maisie Lavelle was also invited to the Lancashire Tennis Awards and was recognised along with the other players who were chosen to represent Lancashire this year in the AEGON County Cup.